Has to be one of our absolute favourite lodges of all! 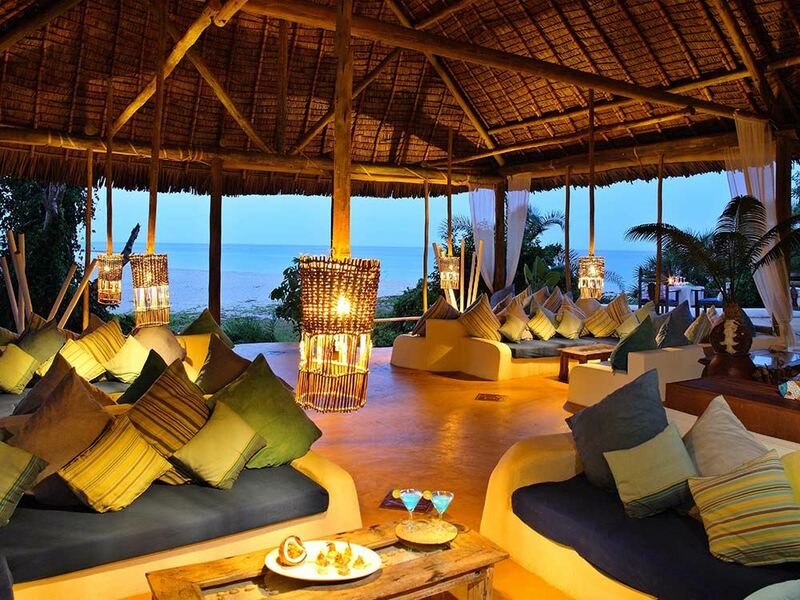 Fundu Lagoon boasts a blissful sense of luxurious isolation – yet its funky and fashionable at the same time! The various suites with their massive lounge areas and private decks with plunge pools are simply amazing - we wouldn't blame you if you disappear for the duration of your stay as they are the perfect romantic hideaway! Some of the most memorable bars and dining areas that we've ever experienced - enjoying sundowners on the jetty bar with the waves lapping gently against the legs of the jetty is a magical experience! What awaits lucky guests is the type of island experience Robinson Crusoe could have only dreamt about! The 18 luxury tents are almost obscured by the thick coastal rainforest that coats the hillside above the beach... there's a real sense of isolation and privacy about them, as all you can see are the gorgeous views across the bay. Whilst hanging out in the splendid isolation of your tented sanctuary is very tempting, ultimately it would mean depriving yourself of chilling out in some of the most stylish public areas we saw anywhere in Tanzania (little wonder as one of the partners is a top London fashion designer) -- the spectacular jetty bar is especially unique and welcoming. With a dive school and regular trips across to the gorgeous Misali Island for snorkelling or picnic lunches, more active guests will have their days full. Closer to home there's now a spectacular pool to lure guests away from the beach at low tide, not to mention a treatment room offering a wide range of pampering options. The food is absolutely spectacular --arguably the best we came across in our entire travels - you know that you’re on to something good when you hear your fellow guests raving on about the food being “the best we’ve ever eaten.” So good in fact, that some French guests whilst we were there were convinced that the chef had to be French! But what we perhaps enjoyed most about Fundu Lagoon was the really sociable vibe that accompanied sundowners every evening, where guests came together at the bar before dinner, in many cases probably to muse aloud at how lucky they were to be able to experience such a paradise! 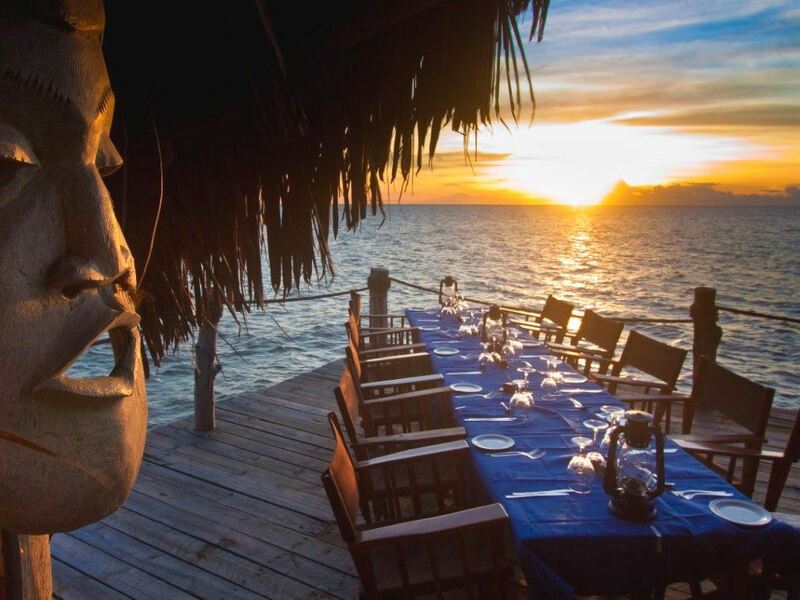 But whilst the food is superb at Fundu Lagoon it’s the surroundings in which you savour it that makes the whole experience so unforgettable. Variety is the key here – one night you’ll find yourself at a table on the beach enjoying a beach barbeque; the next you may be dining under candle-light with a string of tables strung out like twinkling jewels along the length of the jetty; perhaps you’ll be up on the pool deck or one of the beach suite decks for cocktails and canapés – who knows, you could even end up dining in the conventional dining room! 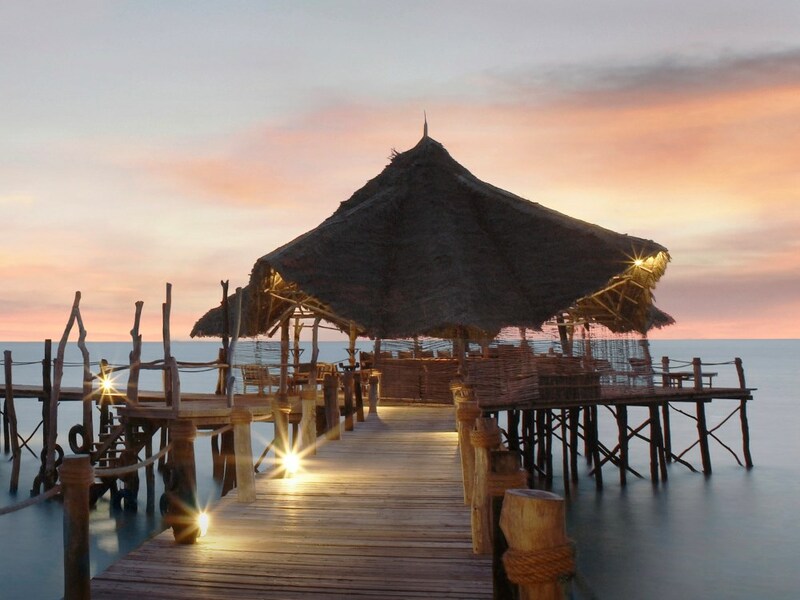 An extra special mention must go to probably our favourite bar in Tanzania, the jetty bar. If there’s a better spot to enjoy a sundowner, whilst watching the sun set over the ocean as the sea laps gently around the legs of the jetty, we’ve yet to here about it! Dotted along the shoreline as well as higher up on the hill enjoying superb views of the bay in front of the lodge, Fundu Lagoon's 18 rooms lie hidden like gems, almost obscured by the thick rainforest that surrounds them. Let's get this out in the open straight away - the rooms here are actually tents. But banish any thoughts of poky common-or-garden camping type tents - these are permanent luxury safari type tents complete with hardwood floors and cooling ceiling fans. The huge double beds feature the finest linen with an enveloping mosquito net suspended from a roughly lashed together bamboo pole framework. Best of all, the view from your bed out over the rustic wooden deck complete with comfortable loungers is basically unobscured. It all makes for a superbly private and unique experience, with vervet monkeys to be seen cavorting in the trees by day, whilst the cries of bush babies surround you by night. 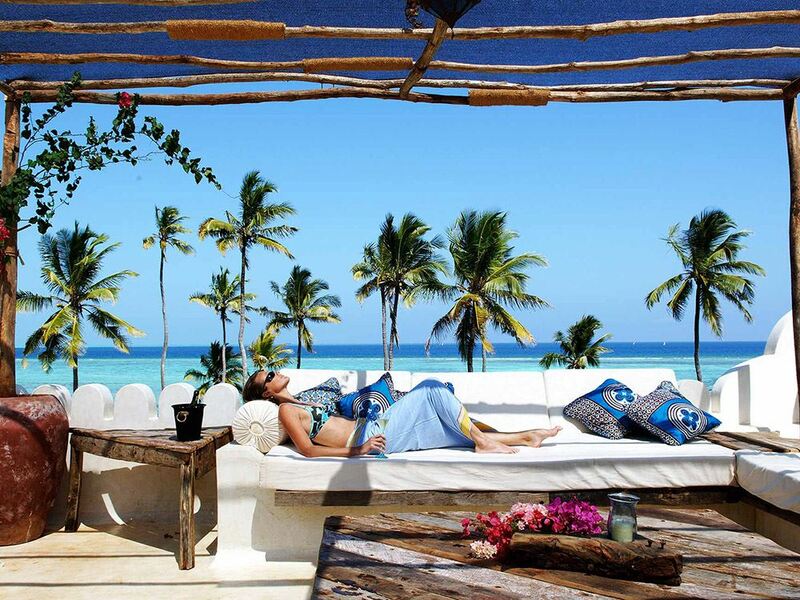 Of course if you’re looking for an even more exclusive experience, Fundu Lagoon offers it in the form of their 2 Suites and 4 stunning Superior Suites. Whilst the room areas are also under canvas, they are even more spacious whilst the bathrooms come complete with romantic double showers. But the clincher for us are the huge decks of roughly hewn wood complete with splash pools and a large separate chill zone with comfortable loungers and strewn with floor cushions – little wonder then that guests in the Superior Suites often basically disappear, only to emerge for meal times! The more exclusive sister-lodge to Matemwe Lodge, the 4 wonderfully atmospheric double storied villas of Matemwe Retreats with their private butlers and plunge pools are a honeymooner's dream!